If you are like me, you don’t particularly enjoy dealing with all the snail mail — much of it crap you didn’t ask for and don’t want — that comes flying your way via the US Postal Service. Perhaps, also like me, you figured dealing with the stuff to be an inevitable and inescapable chore of modern life. Perhaps you, like me, would jump at the chance to significantly reduce the hassle of dealing with your mail. I don’t mean just rerouting or reducing the amount of mail you get, although that’s great, too. I’ve taken advantage of every “opt-out” and “do not ever mail crap to me on pain of death” option I could lay my hands on, and still I am deluged with crap. There’s no sense getting mad at the USPS, though, they’re just the messenger. What are we, the poor tired masses, to do? Well, who knew that radical alternatives were being cooked up by some mad geniuses in Seattle. I probably would not have found out about the company at all if it weren’t for our European Romance. Since we’ll be away for the entire summer, I had to find a way to deal with the darn snail mail. As per usual, I started with a Google search, and wonder of wonders, there was Earth Class Mail. Earth Class Mail is changing how postal mail is delivered, for the betterment of individuals, businesses, national post offices, and most importantly – the planet. Instead of making physical postal deliveries which are so dependent on fuel for planes and trucks, we deliver postal mail online - where people can deal with it instantly, anywhere in the world. No matter where our customers are, they simply log-in to view pictures of their mail and decide what they want to do with each piece. For example, they can choose which pieces to have opened and scanned so they can read them online, and which to recycle, archive, or have sent to them in “snail mail” form wherever they are located – all with the click of a mouse. Wow, this sounded great to me! I love my computer and am happy handling my business tasks online as much as possible. I’ve even been noodling on going paperless entirely. In contrast to many activities in our ever more digitally-enhanced lives, standard mail has remained hooked on physical paper. Even worse, since we moved to a private road in the country, we must get in the car and drive to the post office to retrieve our mail, since the USPS does not deliver to our home. Talk about old tech! Annoyance factor aside, I dislike the waste of my and everybody else’s time and other resources, both monetary (those advertisers’ dollars are going straight into the trash) and environmental (I have to drive my trash to the collection site in order to dump all that useless paper I never wanted in the first place). I read as much as I could find online about the company, which was not a whole lot, and not all of it was flattering. I decided to sign up anyway, since if the service actually delivered on its promises it would be the perfect set up for Conal and me. I created an account for both of us, chose a mailing address in Seattle (for no other reason than because it’s my hometown), and went about obtaining and mailing notarized authorization forms to ECM, which are required by USPS in order for the company to receive mail on your behalf. I was all set to receive mail via ECM. I asked my mom to mail me something as a test. Shortly thereafter, I received an email notification that I had received a piece of mail and voy-oh-lay, there it was in my online inbox, including a scanned image of the front and back of the envelope. Cool! I proceded then to instruct the USPS to forward all our mail to our ECM address. Now, after about two months of using the service, I can wholeheartedly recommend it. Automated email notices are sent to alert me of activity on the account. I can log in to the system anytime and review JPG images of the front and back of new mail, decide what I’d like to have opened and scanned, recycled, shredded, forwarded to another address, or archived. 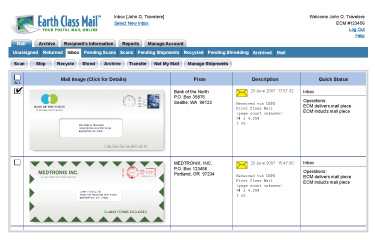 Conal reviews his mail on the same account, and we can transfer items back and forth, with notes as to what sort of action might be needed. So far, I’ve not needed to have anything forwarded to me in Europe. Items that I want to have frequent access to, I download onto my hard drive (the scanned files are in PDF format) for reference as needed. Even that is usually overkill, as archived mail is always available in the system. When we get home this fall, I’ll stop the USPS forwarding and our regular service will resume. However, I will very likely be switching a good deal of our mail to our ECM permanently. This is technology that reminds me of Skype, which changed how many people (including me) perceive and execute voice communication. I’m enjoying a similarly seismic shift in how I relate to postal mail. An appreciative tip of the hat to Earth Class Mail.